Scary Spice arrived to the set with her mother Andrea Brown, left, who dragged Mel's suitcase containing a change of clothes, her makeup kit and extra hair extensions. 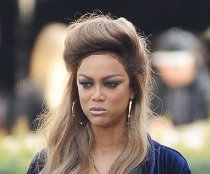 Also on the set was America's Top Model host Tyra Banks, who appeared to be in a foul mood. Mel B shole is pretty but she is a lying whore to me now. And...you know what? Nevermind. Tyra is looking every bit the drag queen these days. Tyra done filled out nice. It's up to you whether you can live with the craziness after the sexiness has worn off. Now now... I didn't mention anything about wanting to have any form of relations with her, I just commented on her outer beauty was all. I hate the hair...I hate your mom is your bag handler....I hate the shorts....i really really hate your mom is your BAG HANDLER. Auntie you on Mel B's payroll now? Oh this is how I FEEL!!! I didn't mean you specifically. I meant 'you' in general. these celebs pay alot of money for those effed up weaves !!! ? i could move to LA & make a killin ??? Mel B! Whoa! Got 40s looking like the teens. Wow. It's positivity Monday so all I'll say is, wow, Tyra's so ready for Halloween... early! Yay! She needs to consult you. They never learn. Can Mel's shorts get any shorter? She has little girls...that's a technical foul. Help the out hunny...we know you'd hook em up! Mel B looks good in that dress. Mel is stealing my heart pic by pic? That weave is awful. Look like her daughter did it, do better Mel with yo lying azz. Mel looks amazing! However, that 1995 styled wig is a no ? Uh-oh... I thought Mel B's hair looked cute but you Roses are saying hell to the naw...LOLLOLLOL!!!! Mel B issa NO FOR ME baby wat is you doin ?? Mel B looks good for 42. Yes, it was that man Stephen Belafonte. The man who "hired" the nanny in the first place. He apparently manipulated Mel and then all three of them went into a three-way relationship. He also had secret relations with the nanny, which caused more problems. He also beat Mel B up. It is cute but it's a lot ... ?? I see her going bankrupt. Mel B looks beautiful in MY opinion she always was my favorite spice girl ? Mmm yeah. I love Tyra but she looks ? otherworldly in this photo. ? This gif kills me every time!! ?????? 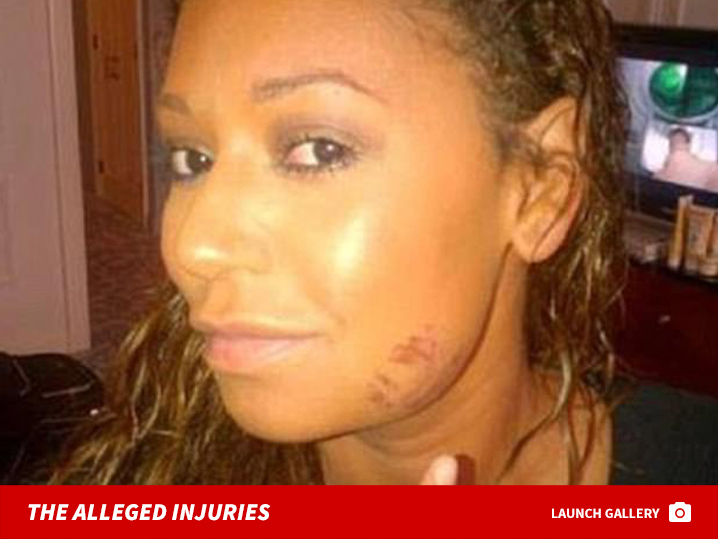 What has Mel B done to her face? She looks unrecognisable. Mel leave your face alone. Or any rug for that matter. Whatever you are doing....STOP! you are loosing WAYYYY to much weight and it is not looking good. You have always been a beautiful curvy black woman...now....IDK....but please....and also please stop wearing waayyy to much foundation....you look cray. Well Mel B is is a known bisexual, she was in a lesbian relationship before she got with Eddie Murphy. She's also made out with all 4 Spice Girls, including Victoria Beckham. Victoria was furious several years ago when Mel B revealed their lesbian kiss, because her kids got bullied at school. Mel B's lesbianism was always made fun of where I live, back in the early 2000s. Mel B and Emma Bunton aka Baby Spice.